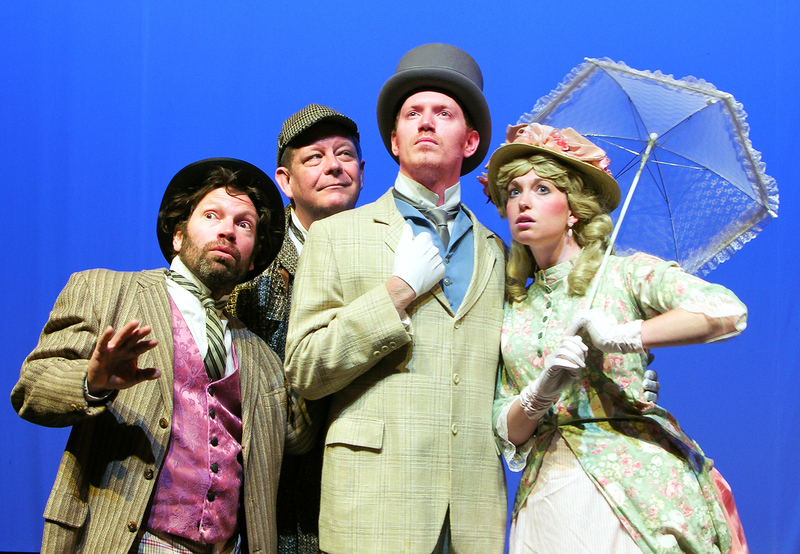 California Theatre Center’s 28th Summer Repertory season opener, Around the World in 80 Days, adapted by Mark Brown and based on the Jules Verne novel of the same name, is quite a trip. Intending to appeal to the widest possible audience – children and adults alike – Brown adapted Verne’s story into his stage play and published his work in August 2007. Originally requiring only four men and one woman in the cast, any number of actors up to 39 could be employed. The well-known story chronicles Phileas Fogg and his manservant Passepartout on their 80-day, around the world journey, all in an effort to win an unlikely wager. Set in the days before air travel, or rapid ocean vessels, this seems an impossible task for our heroes, especially given they are being relentlessly pursued by Detective Fix who’s bent on arresting Fogg for a bank robbery he’s alleged to have committed. Starting and ending in London, they travel by rail, elephant, sled, foot, and steamer, encountering numerous indigenous characters and various impediments along the way as they race the clock, and the calendar, on their journey. CTC Resident Director, Will Huddleston, has pulled together a dexterous and agile cast of 6 actors (four men and two women) to play all 39 parts using all manner of theater including: various accents, quick changes, puppetry, and shadow play. A Foley table (so named for sound effects pioneer Jack Foley) sits toward stage left with its array of percussion equipment to simulate door knocks, thunder, clock sounds (chimes, time passing), train whistles, train engines, and so on. The actors, when not in a given scene, very effectively take turns providing all the sound effects. As an aside, when the actors are behind the Foley table, they often also assume roles as Market Sellers, which is carried as a running gag throughout the play. The only actor playing a single part is Justin Karr as Phileas Fogg. His presence is proper and matter-of-fact, as he is the master of the wager and the journey. Noel Wood as Passepartout for the bulk of the play, and John Sullivan for only the initial club scene when the wager is born, has wonderful comic timing and delivery. His two characters range from proper British as Sullivan to a wild Frenchman as Passepartout, clearly played for laughs and ingenuity as he continually gets into, and creatively out of, various predicaments along the way. Charlie Shoemaker plays several parts, although he spends most of his time as the doggedly determined Detective Fix, who, when initially meeting Passepartout stammers on his name and title, so Passepartout picks that up and calls him “Detectamafix” thinking that is his name for the bulk of the story. Shoemaker is also very funny, trying to keep tabs on Fogg. He shifts to several other roles for brief periods and impressively completes a rather cramped costume change from inside a trunk at one point. His Detective Fix has a very funny bit late in act 2 when he finally addresses the “Detectamafix” moniker. Additionally, Shoemaker plays a very convincing, and unexpected, part toward the end of the story. Both of the women in the cast play several parts. In Ansley Bice Keenan’s case, she quite convincingly plays only men. Keenan is adept at switching accents and characterizations throughout the play, often assuming rather authoritative characters opposite much larger actors. Hilary Ann Stevens on the other hand, while shuffling through several parts including a few men along with the female lead, isn’t quite as adept at playing cross-gender. Her manner is too feminine and her voice has the wrong timbre to pull off believable male roles, so they are instead played for comic effect. Her Aouda; however, is quite good, and she’s the perfect heroine and romantic partner for Karr’s Fogg. Thor Bautz catches many of the other minor roles, many played for comedic impact. His engineer is particularly well done, and his Young Parsi executes some rather athletic moves and brings a creative elephant to life, nicely manipulating the trunk as a master puppeteer. Most of the actors’ accents work well, but in one case when Bautz and Keenan become Asian, some of the dialog becomes unintelligible. Michael Cook’s single set works well. Being part of a repertory rotation, the set design needs to serve not only this show, but others in the series and has to serve multiple purposes, and periods, with only minor modification. The primary structure is a back wall with a large clock fixed at 8:54 which, given the focus on time and watch synchronization at various points during the story, is momentarily distracting. From the back wall, an archway/column arrangement spans along each side of the stage providing a useful frame through which the action can flow. A large table is a kind of “utility” set piece that is creatively used upright with leaves folded as a table or as a base for several props, on its side with the leaves out as the side of a railroad car, or upside down with the legs upright as a sled at one point, and as a small boat at another. A ladder lying on its side is extended out as the bow of the boat, providing not only the angular structure, but a bench upon which actors can perch. In the train configuration, on occasion the actors’ motion becomes unsynchronized, so the illusion falters for a few moments. By contrast, when “traveling” by ship, the crew and passengers quickly get their sea legs, rocking in unison to convey that impression. A versatile, large white sheet makes several appearances throughout the play. It’s used as many things: a sail, a backdrop, a tent, and even a scrim behind which some shadow violence ensues. Costume designer Jane Lambert has assembled convincing attire, conforming to the time period rather nicely, with the various ethnic garb providing colorful accents. An enjoyable romp through an old story and suitable for children and adults alike, Around the World in 80 Days continues in rotation with three other plays through late July. The rest of the summer rep series includes: Agatha Christie’s Black Coffee, The Servant of Two Masters, and The Emperor’s New Clothes, the last one specifically aimed at children of all ages. All performances are held at the Sunnyvale Theatre – Sunnyvale Community Center, 550 E Remington Drive, Sunnyvale, CA 94087. Single tickets range from $10 – $25. Discounts are available for students, seniors and groups of 6 or more. For tickets and more information, call the CTC Summer Rep Box Office at 408-720-0873, or visit www.ctcinc.org. know I am getting know-how daily by reading such good posts. Sounds like you might need a new theme.